Today, in honor of Valentine's Day, I want to share with you a special exclusive "love-themed" video preview from Mask and Wig's very funny spring show "Oh the Humanities" which just opened up on campus. ...This summer I had the opportunity to read an early treatment of Mask and Wig's 121st annual spring show "Oh the Humanities!" and it was great! I encourage everyone to see it if they can. In the video above, a male artist woos a girl with a love song about painting her. 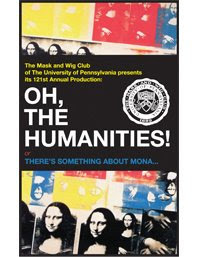 In Mask and Wig's 121st Annual Production, "Oh, the Humanities!" The Mask and Wig Club takes its patrons back to one of the most inspirational, creative, and reasonable places in history: Florence, Italy during the Renaissance. Michelangelo is the new up-and-coming artist in Florence, while Leonardo Da Vinci is the perennial powerhouse Renaissance man. But Leo's girlfriend Mona Lisa smooches Mike in public, making the front page of the tabloids! Suddenly, Mike is widely successful and Leo has fallen from his perch. However, the political genius Machiavelli, seeing that Da Vinci is down and out, offers his help as an art agent. Almost overnight Da Vinci's paintings are selling for mega-florins again and Mike is just a passing fad. But all is not as it seems. What shifty business is Machiavelli up to? What is Mike up against? Paints, plots, and the classical beauty of our eight-"girl" kickline, all in this year's Mask and Wig masterpiece: "Oh, the Humanities!" Due to continued delays in the renovation of our Historic Clubhouse, this year's production will be held at the Prince Music Theater (1412 Chestnut St, Philadelphia, PA 19102). Missed yesterday's Love Week '09 post? ....Click here to get serenaded from the Glee Club! 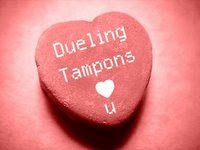 Better Than Sending You Chocolates! Penn in Hollywood: "What Makes a Good Pitch?" Penn in Hollywood: "Can Someone Give Me a Job?"